This light and gently purifying cleansing cream lifts away daily impurities, make-up and even waterproof mascara, revealing smoother, clearer and brighter-looking skin. Enriched with organic Shea butter, Jojoba esters, Aloe Vera and Calendula, it leaves the skin refreshed, purified and softened. 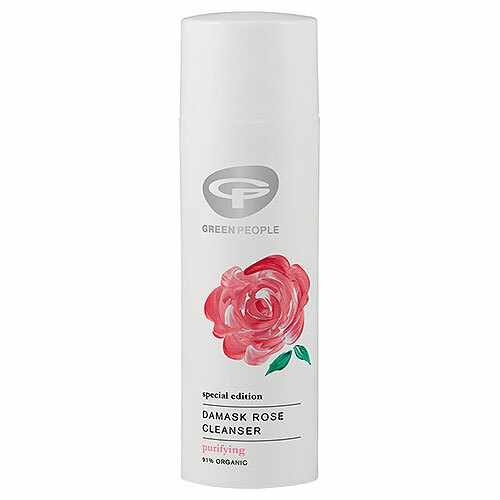 Precious Rose Otto is blended with Jasmine for a timeless floral aroma. Aqua, Olea Europaea Fruit Oil*, Helianthus Annuus Seed Oil*, Glycerin*, Butyrospermum Parkii Butter*^, Squalane, Cetyl Alcohol, Cetearyl Glucoside, Cetearyl Alcohol, Elaeis Guineensis Oil*^, Glyceryl Stearate, Aloe Barbadensis Leaf Juice Powder*, Simmondsia Chinensis Seed Oil*, Rosmarinus Officinalis Leaf Extract*, Calendula Officinalis Flower Extract*, Aroma [Rosa Damascena Flower Oil*^, Jasminum Officinale Flower Extract*, Citrus Limon Peel Oil*, Origanum Majorana Herb Oil*, Citrus Aurantium Leaf Oil*^, Ocimum Basilicum Herb Oil*, Lavandula Angustifolia Herb Oil*^, Pelargonium Graveolens Oil*^, Cananga Odorata Flower Oil*^, Cinnamomum Camphora Bark Oil, Styrax Benzoin Resin Oil], Hydrolysed Jojoba Esters, Sodium Stearoyl Glutamate, Benzyl Alcohol, Salicylic Acid, Sorbic Acid, Benzyl Benzoate, Benzyl Salicylate, Citral, Citronellol, Eugenol, Farnesol, Geraniol, Limonene, Linalool. Using fingertips apply in small circular movements to face and neck. Remove with cotton wool, damp face cloth or wash off with warm water and follow with a splash of cold to stimulate circulation. Below are reviews of Green People Damask Rose Cleanser - 50ml by bodykind customers. If you have tried this product we'd love to hear what you think so please leave a review. This light and gently purifying cleansing cream lifts away daily impurities, make-up and even waterproof mascara, revealing smoother, clearer and brighter-looking skin.